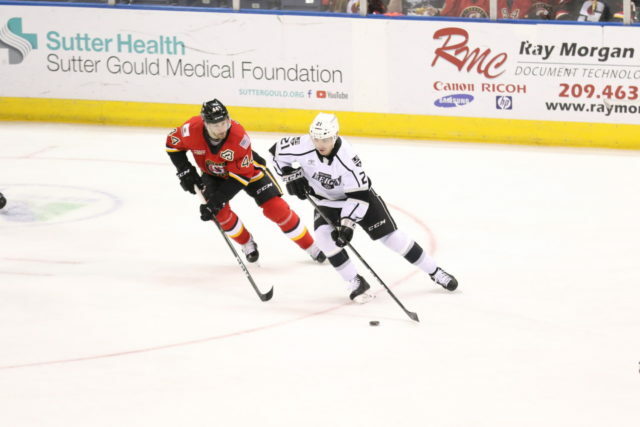 The Ontario Reign made it three wins from four April games as they skated to their largest victory of the season, a 7-2 win over the Stockton Heat on visiting ice. 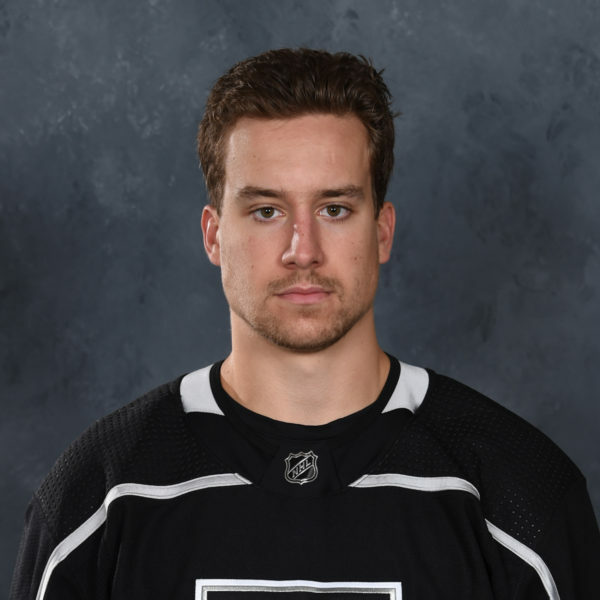 The Reign got two goals apiece from Zack Mitchell, Mike Amadio and Austin Strand, the first multi-goal game of Strand’s professional career. 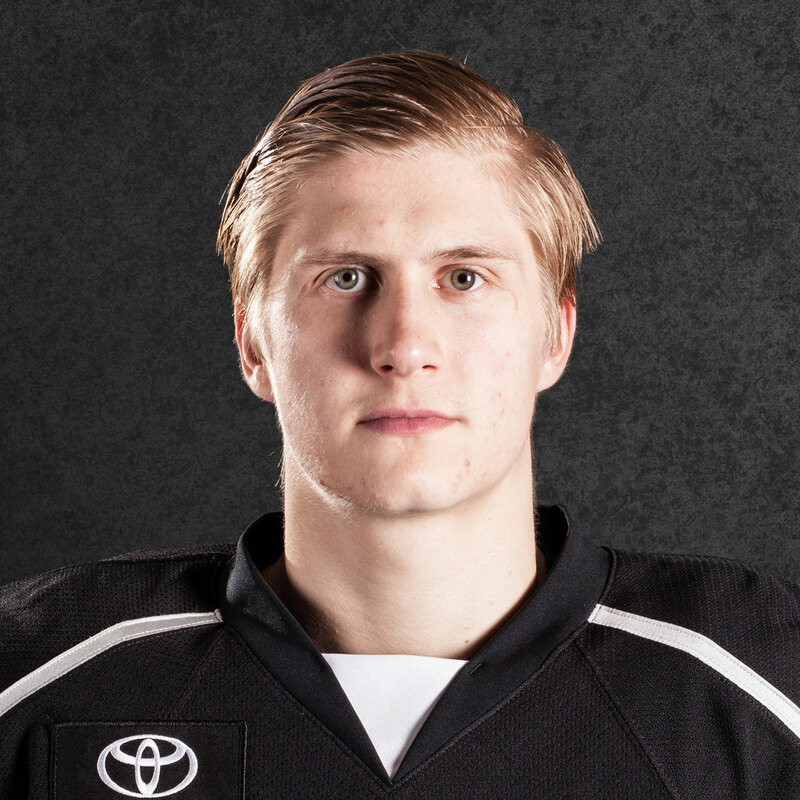 Forward Aidan Dudas collected the first points of his professional career with two assists, while Ontario also got 27 saves on 29 shots from goaltender Cal Petersen, who improved to 3-0 during the month of April. 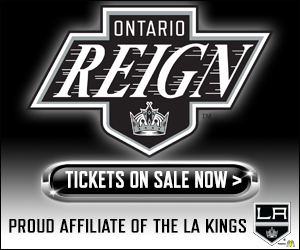 The Reign dropped four goals in the third period to blow the game open, while Petersen slammed the door shut at the other end, highlighted by an athletic post-to-post stop with the left pad late in regulation. 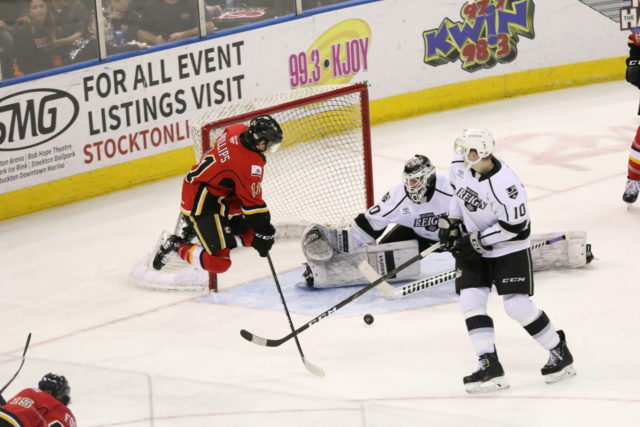 In a battle tonight between two teams eliminated from the postseason, the Reign showed that they have not checked out down the stretch, despite their positioning in the standings. Ontario defeated a pair of playoff contenders on home ice last week, and showed their mindset in full bloom tonight with the blowout victory. The two teams traded first period goals to enter the first intermission deadlocked at one. 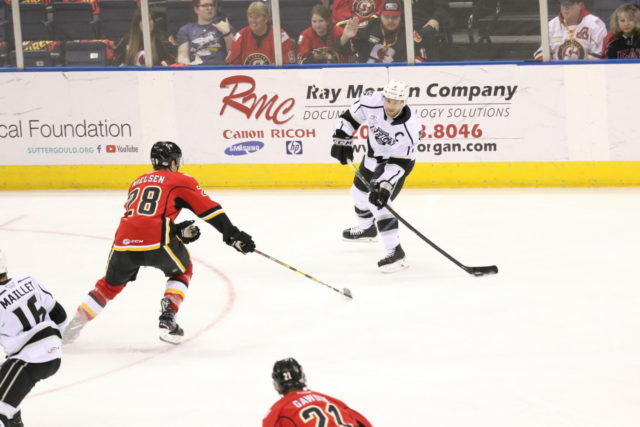 First, just shy of the halfway mark, Stockton forward Ryan Lomberg fed teammate Curtis Lazar in front of Petersen, where the 2019 AHL All-Star buried first time from point-blank range to open the scoring. Mitchell then knotted the score at one as the first period wound down, finishing off a well-placed feed from Daniel Brickley to tie the game at one 3:06 from the first buzzer. The Reign scored twice in less than a minute late in the second period to open up their first lead of the evening. First, forward Philippe Maillet fed forward Moulson for a one-timer at the back post and the veteran forward wired his shot past Stockton netminder Tyler Parsons for his 27th tally of the season, tying Jonny Brodzinski (2016-17 season) for the most goals in a single season in franchise history. 50 seconds later, Dudas made a nice move towards the net and fed Mitchell for another tap-in, this his second of the game, to put the visitors on top 3-1 with the rookie’s first pro point. Stockton came back with the final goal of the frame, which came just 37 seconds after Mitchell’s goal, as forward Mason Morelli scored his first career professional goal. 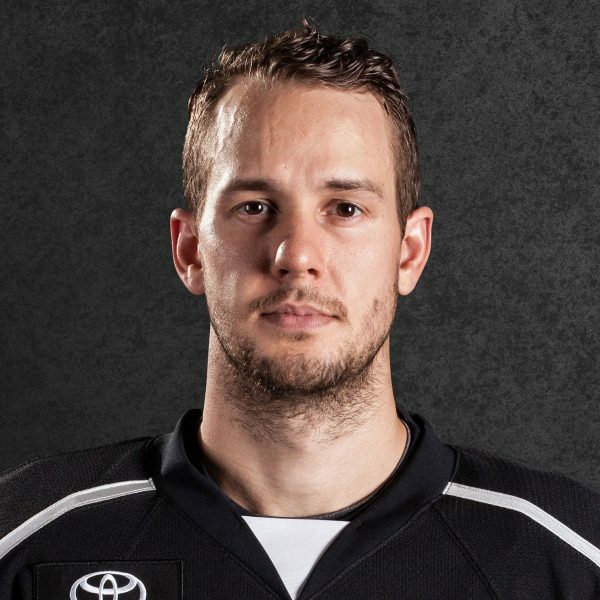 Ontario blew the game open in the third period with a quartet of goals, starting with Strand’s first of the evening, as he drove to the net from the right point and scored on his second effort, a rebound on the backhand from close range. Strand added another goal later in the frame, as he took a pinpoint feed from Mitchell and wristed past Parsons from the slot. 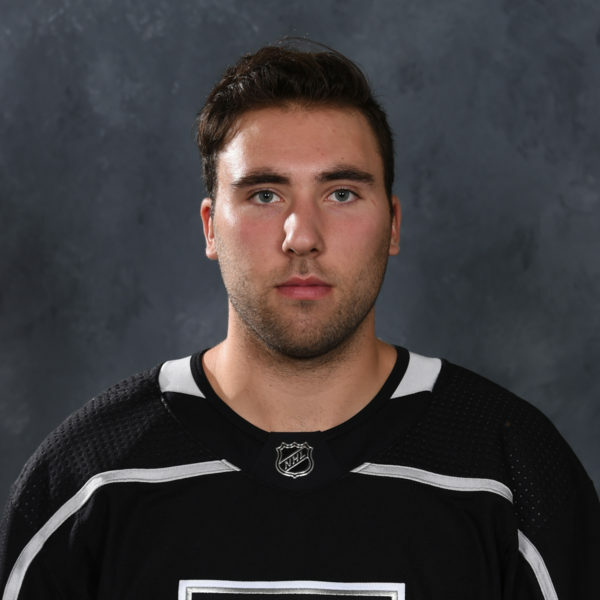 The Reign got a pair of late goals from Amadio, including a silky-smooth breakaway effort, beating Parsons through the five hole, for the team’s sixth of the evening to close out the victory. 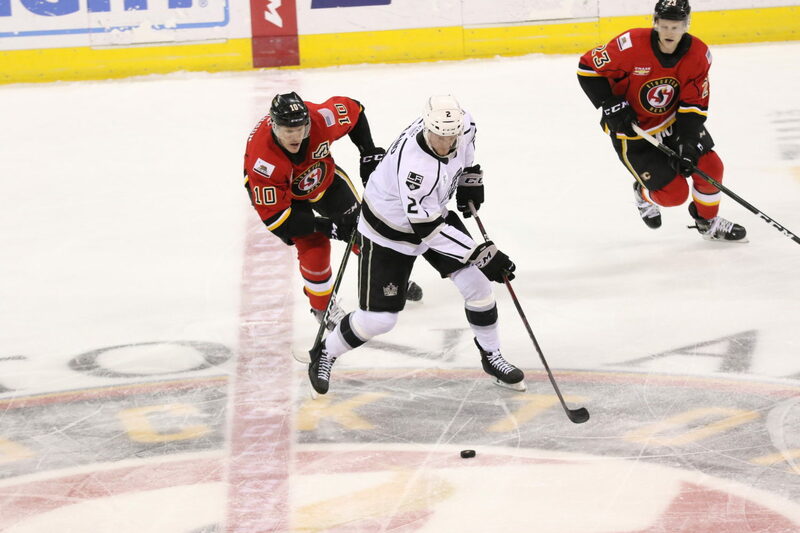 The Reign and Heat will rematch on Friday in Ontario in the Reign’s final home tilt of the 2018-19 season. Puck drop is slated for 7 PM at the CBBA. It felt pretty good. I was playing with some pretty good players and we made some pretty good plays, it felt good. I think we’ve been playing well. We’ve just been playing simple, getting pucks out and getting pucks in, good in the d-zone and we got rewarded in the o-zone. For sure. Even after practices, he’s been helping me with a few little things to get comfortable and stuff. He’s a guy that you can look up to. Yeah, I think so. I think speed’s never really been an issue for me, but I think obviously there’s a lot of bigger, stronger guys and I think I’m starting to feel a little bit more comfortable. Absolutely proud of these guys. Mentally, it’s hard to remain engaged when you are mathematically out of the playoffs with only a couple of games to play. So now it is a test of character and leadership, two things that I have never doubted with this group. A true team cares about each other, they don’t want to let a teammate down. This group has stuck together all season long through many adverse conditions. Tonight was a great example of a bunch of guys having fun and enjoying their remaining time together. Well, there were times at the start of the season, when you watched him play, that you might of thought he was nine cents short of a dime? He struggled to find himself, even spent some time in Manchester. I think the early struggles, the healthy scratches and the demotion made him realize he had to get serious about his preparation as a pro. The process has been good for him. He took advantage of the opportunity when Walker and Roy went up to the Kings. Then Dermy went up and Kale broke his foot. When opportunity knocked he opened the door. He has made good strides offensively and is working hard to improve the defending side. He’s a good kid. Good for him. Mitchell has no kids of his own, but he definitely has a future in child care after hockey. He has welcomed the opportunity to mentor, and raise, Dudas and Morrison like they were his own. His patience has benefited the entire line. It was nice to see Dudas get on the pro score sheet. There were a lot big moments tonight. Dudas two apples. Mitchell two goals, Strand two goals, Amadio two goals, Luff two apples, Moulson two points and Maillet got his 50th point. But the biggest shout out should go to the phenomenal goaltending performance of Calvin Petersen. He’s the real deal.